Kick off your visit on the 18th (Mon): see the interesting displays at Museu Pedro Ludovico Teixeira, then stop by Flamboyant Shopping Center, and then tour the pleasant surroundings at Flamboyant Park. For where to stay, other places to visit, ratings, and tourist information, go to the Goiania tour planning app . Brasilia to Goiania is an approximately 3-hour car ride. You can also take a bus; or fly. Expect a daytime high around 35°C in February, and nighttime lows around 23°C. Finish up your sightseeing early on the 18th (Mon) so you can catcht the bus to Caldas Novas. Start off your visit on the 19th (Tue): admire the natural beauty at Japanese Gardens, then make a splash at diRoma Acqua Park, and then pause for some serene contemplation at Shrine of Nossa Senhora da Salette. To find ratings, photos, and more tourist information, go to the Caldas Novas travel route builder app . You can take a bus from Goiania to Caldas Novas in 2 hours. Alternatively, you can drive. The time zone difference when traveling from Goiania to Caldas Novas is minus 1 hour. Finish up your sightseeing early on the 19th (Tue) so you can travel to Valparaiso De Goias. Start off your visit on the 20th (Wed): buy something for everyone on your list at Shopping Sul and then make a splash at Clube Recanto das Aguas. To find where to stay, reviews, other places to visit, and other tourist information, use the Valparaiso De Goias tour planner. You can drive from Caldas Novas to Valparaiso De Goias in 4 hours. 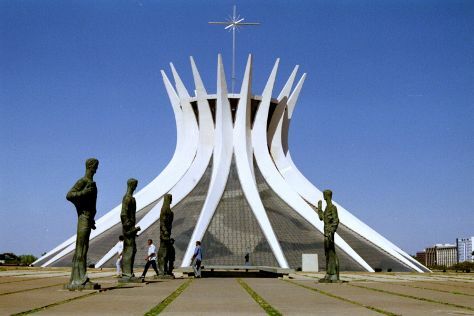 Finish your sightseeing early on the 20th (Wed) so you can travel to Brasilia. Kick off your visit on the 21st (Thu): admire the striking features of JK Bridge, take a leisurely stroll along Pontao do Lago Sul, then take in the spiritual surroundings of Catedral Metropolitana, then admire the striking features of Itamaraty Palace, and finally contemplate in the serene atmosphere at Santuario Dom Bosco. Get ready for a full day of sightseeing on the 22nd (Fri): stroll through Parque da Cidade (Sarah Kubitschek), get engrossed in the history at Memorial JK, then ponder the world of politics at Congresso Nacional, and finally see the interesting displays at National Museum of the Brazilian Republic. To see where to stay, photos, more things to do, and tourist information, read our Brasilia tour itinerary planner. You can drive from Valparaiso De Goias to Brasilia in an hour. The time zone difference when traveling from Valparaiso De Goias to Brasilia is 1 hour. In February, plan for daily highs up to 32°C, and evening lows to 21°C. Finish your sightseeing early on the 22nd (Fri) so you can travel back home.